Tonight's guest review is from Gary at the terrific retailer Toyboxer.com. Check out the site when you get a chance - now on to the review! 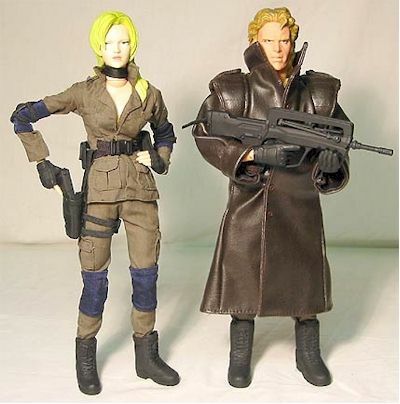 These figures are from the Konami video game Metal Gear Solid from left to right Solid Snake, Meryl Silverburgh, Liquid Snake, and Sniper Wolf. These were made by Yamato Toys and distributed by Toycom for Konami. I don't believe these figures have been reviewed by anyone, in fact I think they went unnoticed because I don't recall seeing them sold anywhere. 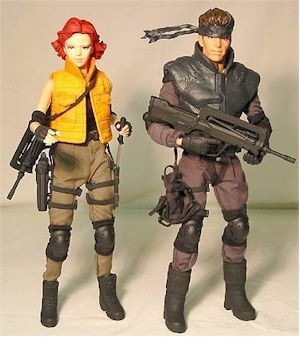 I remember seeing early prototypes at http://www.figures.com and a friend of mine said he found Snake and Meryl at Electronic Boutique in the mall a few months ago. I happened to get mine from a person selling them on eBay. Instead of buying them I did a trade for the whole set and was quite pleased with my deal. do that though. But forget ever using the ties that keep it locked up because they must be cut off to get the figure out. Be careful, I stabbed my knuckle with a knife trying to get them out because they are really tight. 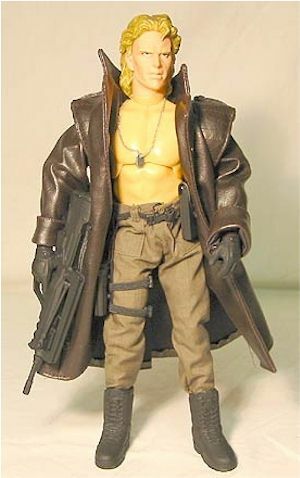 The head sculpts are really fantastic, I especially like Meryl, Sniper Wolf and Solid Snake the best. The girls really do remind me of the artwork used and the characters from the game. They have an animated look to them, without the goofy eyes that japanese animated characters tend to have. One thing that's different from most of my 12" figure head sculpts in my collection is that the hair on these figures is not molded with the head, it seems to have been attached. Possibly Solid Snake is the only one not like that. But its goes unnoticed and I kind of like it. I think maybe it looks a little better doing it that way. I have done all my head sculpt hair customs the same way. It says on the box that the creator of the game had direct supervision of these so they are rendered down to the smallest detail. The paint ops are perfect here lips, eyes and hair all nicely done. 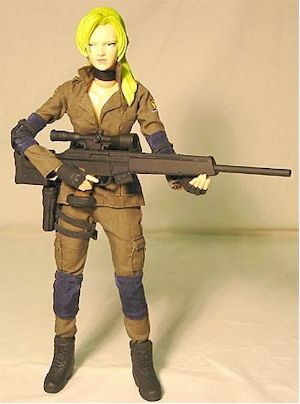 It doesn't get a perfect rating because I think the green and yellow hair of Sniper Wolf will need to be repainted to suite my tastes. I think its too green and maybe shouldn't have green in it in the first place? I really like Meryl's red hair though, nicely done. I'm not really sure if they deserve a 3 or 2 1/2 star rating here. In most cases I think the higher because the figures are really poseable and fully articulated. Snake is probably the only one that can't be posed as much as the others. But it's only because his vest hampers his arms a bit. I did not undress them because putting them back together wasn't something I wanted to do. I don't really care if a figure has 18 or 24 points of articulation. As long as you can do a fair amount of poses and the figure can stand on its own I'm pretty happy. I think these have joints similar to a Volks type body though, but I'm not sure. They are much heavier than a Dragon Models body if that helps. weren't floppy, thank god. Much better than the 12" Final Fantasy figures that came out last year. Overall I was very happy with the outfits of all 4 figures. Remembering back from the video game, all four seem to be dressed pretty authentic. 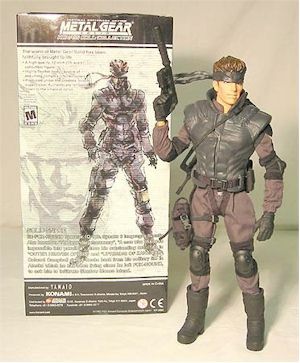 Solid Snakes vest is really nice, movement limiting for the arms but still really nice looking. Also Solid Snake got the cloth holster with a pouch for his silencer, a pouch for his laser targeting unit, and the room for the HK as well. Everyone else had holsters made from soft form fitting plastic, nice stuff not cheap looking. I believe Meryl had a olive drab shirt at one point in the game but also I think later she was sporting the black shirt with the orange vest. Everything is well done so I can't say anything bad about them. or either one of the guys as well. Wish I could give you some comparison shots but I don't have any of these weapons from any other manufacturer to compare with. Meryl's Desert Eagle is huge, bigger than the one that comes with the CY Girls, if you have any of those to look at. As for detail everything is detailed but not as detailed as say Dragon but more like 21st Century Toys detail. 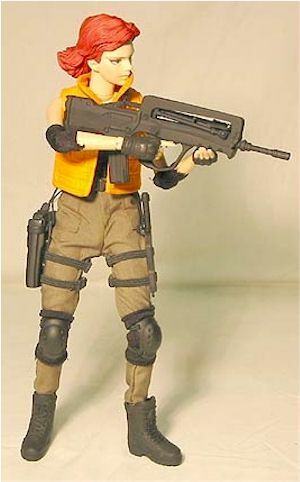 3 of the four figures all come with a FA MAS battle rifle. That was the primary rifle in the game along with HK products like Mark 23's, USP's, and Sniper's PSG 1. All are nice looking but just too big. I found them worth the trade I was able to make. I think they are worth $20 to $25 each I got mine for about $18 each in the trade. Not sure how much they cost online or in the store because I never saw them anywhere. But I have seen a few go on ebay for around $15 to $25 each. Yamato did as good as or better than what Dragon may have done with them. Dragon would have shined when it came to the accessories though but they would had been much more expensive. of Liberty". I hope we don't have to wait as long as this release. But I can't fault them there because I never knew they were even doing these figures till 2 months before they came out. http://www.ebay.com or search video game stores like Electronic Boutique or places like Suncoast in your local mall or online shops like mine. I don't have any to sell you, but I wish I did. Good luck! !